While I was composing this post, I happened to have some free time and discovered a newspaper article reminding me October marked the 100th anniversary of the Russian October Revolution, otherwise known as the Bolshevik Revolution. The Russian October Revolution emerged when an alliance of far-left political parties led by the Bolsheviks overthrew the provisional government of Alexander Kerensky in a near bloodless coup. Not to to turn this post into a mini Russian history lesson, but the October Revolution eventually led Russia into becoming a Communist country. Today’s post will be dedicated to the Russian poet Anna Akhmatova, who wrote before and after this period. One of the pros of participating in book challenges is discovering new authors and books, you would normally never have read. 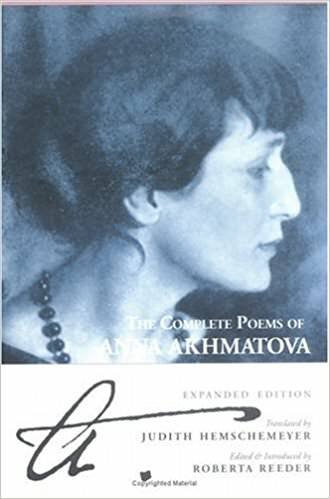 One such book was The Complete Works of Anna Akhmatova by Anna Akhmatova translated by Judith Hemschemeyer. When deciding what book to choose, I decided to read a book that was translated from Russian, specifically around the October Revolution. This period is around the time my paternal great-grandparents left Russia to immigrate to America. Instead of reading the whole span of her career, I decided to stop at the year of my great-grandparents immigration: 1928. Like many others I never heard her name before I stumbled upon her works over the summer. Anna Akhmatova (born Anna Andreevna Goreko) is considered one of the four major lyric poets of the Twentieth Century and considered overall one of the greatest Russian poets. While many of her contemporaries fled Russia after the Bolshevik Revolution, Akhmatova stayed in Russia. I highly recommend you check out more of her biography she like many poets led a very intriguing history with the backdrop of such a radical change of government in a short period of time makes her story doubly interesting. The timing for reading was not what I intended, this was the second book I read after my break up over the summer. Yes, I read it after the disaster that was Bridget Jones’s Diary. As I was reading, I found her words comforting and optimistic. Though, she wrote these poems 78 years before I was born. I felt a bond or an understanding of my complex changing emotions. The simple language perfectly conveys a wide range of emotions that many poets I’ve noticed fail to capture even using complicated wording or imagery. So many awesome lines, for each section I decided to choose one or two of my faves! My opinion of her works is similar to my views about Kahil Gibran in the way I think it’s a shame her poetry is not more well-known. Her poems frequently displays reoccurring imagery such as a season or a particular feeling. When I break down, her book I’ll be including a few of the images standing out to me as I was reading. Imagery: Many of her poems in this volume remind me of Yeats. Imagery: pastoral, yet focuses on the subject of love starts innocent but gradually becomes more sexual. springtime-unhappy, corrupted, or hints of dying instead of growing. How boring, how boring it’s for me to live!” (100). “Somewhere there is a simple life and a world,/Transparent, warm and joyful..
Gradually, in this collection in the second half of this book she focuses more on WWI. Her WWI poems capture perfectly the grief and optimism of a united Russia. As I read this section, I felt a pang of sadness, because I knew how history ended up playing out and all her dreams would soon be smashed by the Bolshevik Revolution. Imagery: death, life, negative about the world, a loss of “wonder” and tangible dreams, and a continuation of her Russian poems. “The Tale of the Black Ring”-perfectly depicts the dark tone and fairy tale quality of the poems in this addition.